There are many Chinese travellers travelling or planning to travel to the worl, and the vast majority of these visitors usually only visits a few places they are familiar with like Paris, Provence and a new popular destination in Asia and so on. The Chinese have a rather limited vision of Travel. Their idea of France usually comes from movies, television series or what they read in the media or microblogs. In order to reach this large demographic of travellers, one must understand the unique web surfing pattern of Chinese people. and because Soon they Will be the Biggest source of international travellers in every country of the Globe. But there are ways to get Outbound Chinese Tourists! Let us look at an overview of possibilities for the tourism industry to attract the attention of Chinese travellers. Here is a range of solutions. Having a website in Chinese is probably the first action required to make yourself known to your customers. 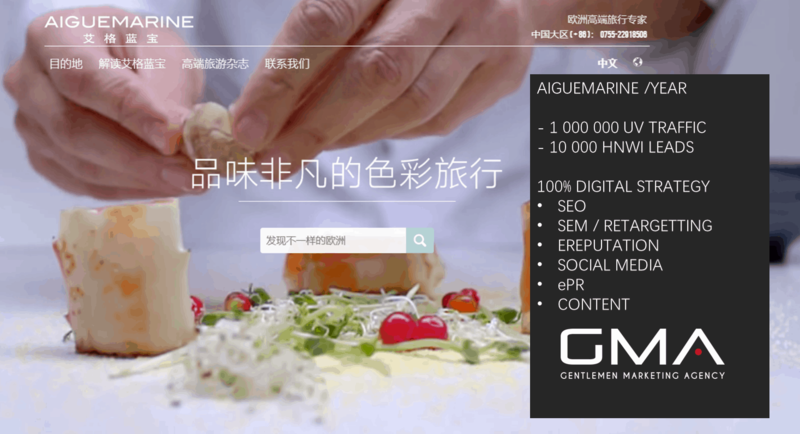 AigueMarine’s website in Chinese shows pictures of France, High-End travel, lifestyle, shops, to peak interests of Chinese travellers due to their love for shopping when travelling to the land of luxury designer goods. AigueMarine is the leading Luxury Travel Agency for Europe for Chinese high-end Clients. The best is to have your site hosted in China, for faster loading. It is crucial to have visitors on your website to arouse their interest, it must attract visitors by SEM (pay per click, banners …) or SEO, talk about your website on forums. 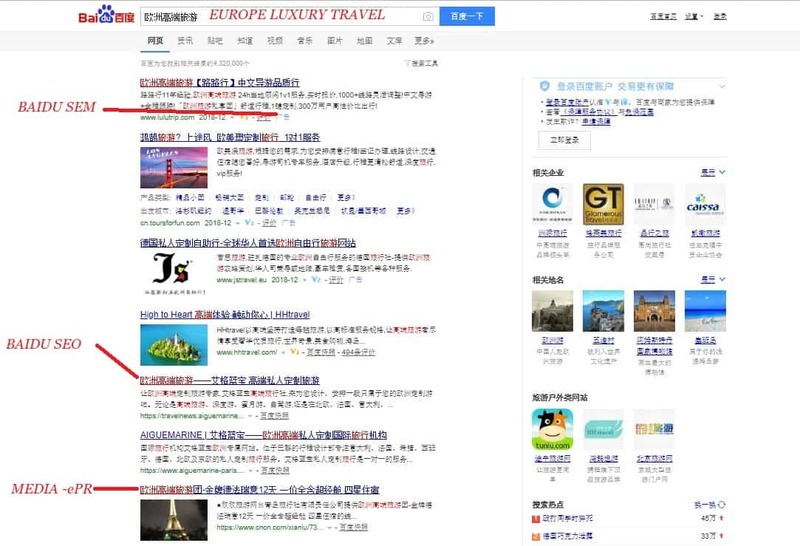 Baidu is the Chinese Search Engine, and get on the Top position of Chinese Search Engine on Popular request will require the Travel Agency, the Hotel or the Tourism Company high-quality visitors. Want partnerships with local Chinese agencies? Chinese People stop to travel to Groups in 2018. 70% of them are independent travellers (FIT) and only 30% are Groups. Most of Traveller book their trip online in China, 80% of the tourism industry in Online. Most of the Free independent travellers are searching for a local experience. They are young, middle class and want to discover the world. VISA policy is better for Chinese, so no need to use travel agents anymore. Few need Tourism Agency like 5years ago. Chinese Travel Agencies are for old People and Poor Travellers. -Fear of adventure: most old and poor Chinese people have never travelled abroad until the recent decade, so they are less eager to explore alone. -Groups: In the Chinese culture old people are used to doing things in groups. -Price benefit: travelling with a travel agency is much cheaper than travelling in a single or small group, and for a price-sensitive society like China, it is one of the driving factors for group travel. They want to use them, copy their itinerary but, it is in 2018 difficult to get Clients from Chinese Traditional Travel Agency. 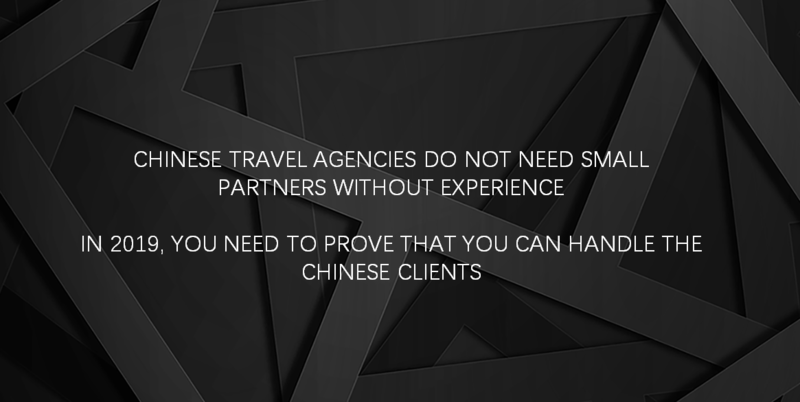 We have a list of Travel agencies, but it is difficult to collaborate, they have specific requirements and are already working with contractors for many years. A good reputation is a must to work with them, or a unique advantage. Internet in China is increasing its influence, both large and small brands utilize the internet to promote their businesses. Whether by direct promotion with banners or indirect via Buzz or public relations, online communication has now become almost mandatory. 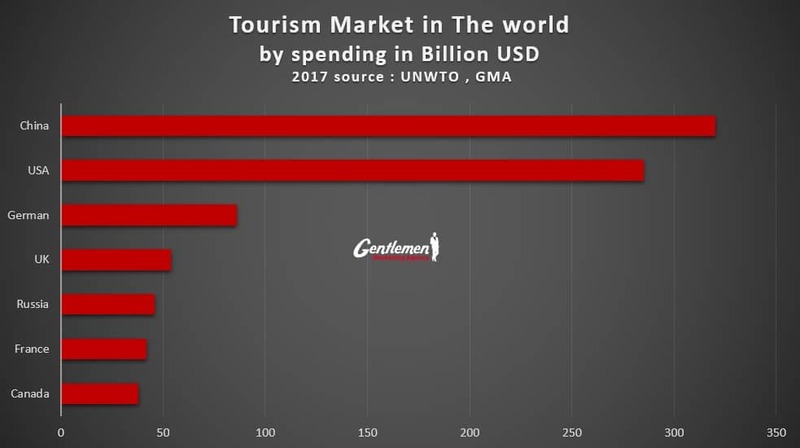 => A low initial investment, ROI (Return on Investment) generally good and measurable, a wide range of media, interactivity with the customer … all these factors make online promotion a big factor in the Chinese tourism sector. Using quality Multimedia is a particularly effective tool in the travel industry. The tourist has to have a fantasy image of the country he will visit. Attractive pictures, videos of fantasy-like images are used by agencies to attract customers looking for a trip, but also to raise awareness about their vacation destination. 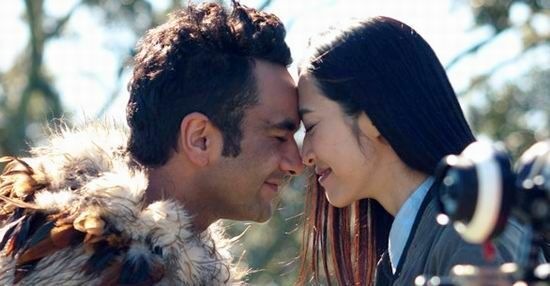 New Zealand conducted a major operation in digital communications and succeeded in attracting many Chinese tourists. Internet influence on Chinese citizens has become vast and wide. The major part of Chinese Internet users spend time on is on social networks, like Weibo. Weibo is a mix between twitter and facebook, it combines the responsiveness of twitter, looking for information with the social and playful side of Facebook. Communicating on Weibo starts by opening an account, obtaining certifications, publishing interesting content, interacting with Internet users around the goal of building a community. Weibo has become a very powerful tool, the number of fans can add up quickly and allows you to spread your offer to up to 80 million active users according to figures reported on Weibo. 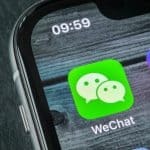 WeChat is the number one social Media in China. You can open an official account and publish news, like a Blog or newsletters. After, you can use Advertising to spread the Message or Groups sharing, do community management to get more followers and reach new Clients. Doing PR in China is very important. It allows you to promote your service to a wide variety of Chinese citizens. This communication is primarily with rich visuals or feedbacks and testimonials from people who have visited the country. 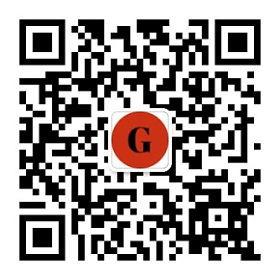 A new article on a Chinese site can be viewed by tens of thousands of times! KOLs (Key Opinion Leader) or stars have this ability to influence a lot of Chinese people with their communities and the secondary network of their fans. These leaders are well respected and have a strong influence on large numbers of fans. Their movements are followed and talked about by millions of Internet users. Angela Baby a star from Hong Kong had the massive amounts of comments on his Weibo when it unveiled its microblog on his stay in France. See also how Chinese tourist choose their hotel! Chinese people do not read magazines, but they real online Magazine. 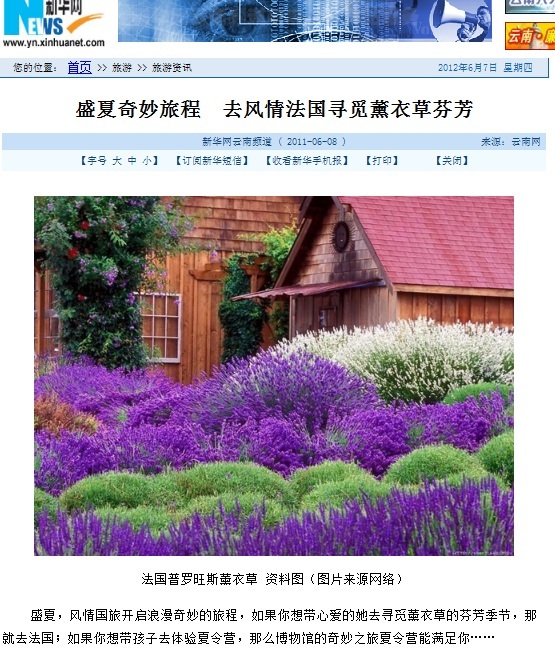 e-publications in China are few but qualitative and the information has an influence on the targetted travellers like magazines in the Western world. In the tourism sector, there are some interesting magazines, but the scope is difficult to assess because the numbers are often inflated. Publication costs are heterogeneous and sometimes abnormally high. Film and television is a medium form of communication to inform the Chinese public of your travel destination. A movie watched by millions of Chinese can make a lasting memory and do wonders. A hit TV series is an ultimate weapon which profoundly influences the mass public. A Chateau Lafite for special occasions, a Mac for professionals, an ice Haagen-Dazs to seduce a beautiful girl … It was during a scene that the consumer thinks the best use of the product or in a place. This discipline is called product placement, a marketing technique to maturity in the U.S. today, and progress in China. The cinema is a reflection of life, real life or the life that you would like to have. The spectator believes what he sees. 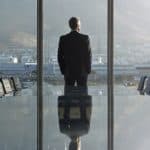 Many companies help shape this reality and allow the director to create his fictional universe. This process is very difficult by China, few foreign companies are able to do this (unlike Hollywood movies). The majority of the achievements is the chance to promote Country. Need a Cost efficient Marketing Agency to Attract Chinese Tourists? We offer cost-effective solutions to help Travel companies who want to attract these Chinese tourists. You want to receive our Case studies for Tourism marketing, contact us. You have a serious project, and you want to speak to our eTourism Consultant, contact us. Very nice article who sump up a lot of truths of this market. now many countries invest to promote themself in China in Asia. only Phillipines have Lost everythings ! Philippines is coming back after cold relationship, but it is a great place, and Chinese like to travel there. THANKS SO MUCH TO THE AUTHOR ! So, thanks again to the AUTHOR !!! it’ll clear ideas to them wonderfully. since some of them dont speak English (sob!). My greeting to all readers. MARINA, from MONZA, ITALY. Very good article. It is a big potential everywhere in the world these chinese tourist, how can they spend so much that s the mystery for many people. Hi Eltohami， glad to see your comment. Would you mind telling me more details about your plan and send to me? Then I can give your more advice. Thanks! I would like to know what our accommodation can do to attract more guests from China. We are based in Glasgow in Scotland, Great Britain. We are a bed & breakfast accommodation seeking Chinese tourists to stay with us. If you view our URL website, we have Chinese translation our website & we are advertised on many hotel websites like booking.com, expedia, venere, hostelbookers etc. 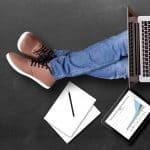 Are there websites that are popular in China that you could reccomend? Are there local travel agencies that you could recomend that send large groups of Chinese tourists to Scotland? I recommand you firstly settle the positioning of your agency and service and then list and contact the potential parnters according to your positioning, that will save you a lot of time and effort. Good luck! I have a travel agency in Morocco. And I would like to work with China tourist and help them for organizing trips in all Morocco. Thank you for sharing these very interesting information. according to my understanding of these market, travelling with groups is still very popular ! Freedom has no price, and the trends DIY (do it yourself) is more and more popular ! Of course if your company is huge and famous enough. 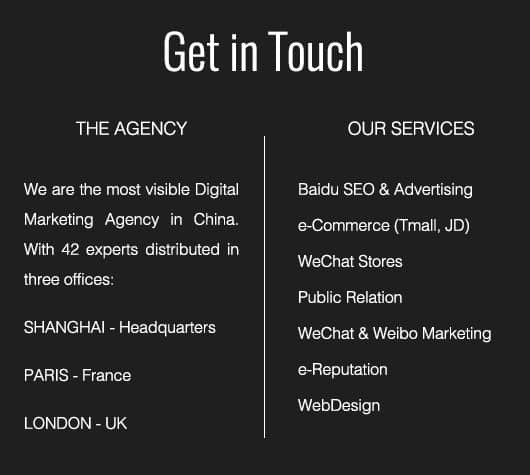 We do not explain how to deal in B2B with Chinese agencies, that is not the topic. A travelling agency who wants to attract Chinese tourists should have Chinese staff or mandarin speakers. Agree with you, if you would like to open a huge market in China, you had better contact directly with Chinese tourisits. Thanks Olivier for this article, it has given me an insight into Chines travel marketing needs although it never mentioned about Chines tourists niche in Africa. I would like to market East Africa and more so Kenya to China Market Through Madiba Tours & Travel as there is a great deal of relationship between China and Africa. However Africa have remained the best travel destination due to its natural wealth. to read content, except this website provides quality based articles about China. This is really interesting, You are a very skilled blogger, and Your website marketingtochina is so interesting. I have joined your feed and stay up for in quest of more of your fantastic post about China. Also, I have shared your website in my social networks linkedin a lot already. Ԍreat post. Ι’m facing ɑ few of tɦese issues. It will really be a huge Market. Your article content demonstrates that you’re actually well written and able to write attention-catching content articles. (hourly, per piece of writing, .etc). Great article, thanks! We have a Bed & Breakfast Guest House in Cape Town. Please can you tell me who I may get to translate our website into Chinese and hosted in China, as I am interested in doing this? I can offer professional online marketing service for you. Hello everyone, I was reading through some of the comments in the start of this discussion, and it took some time for me to realize that you were talking about the zodiac signs? I don’t really get what happened there in the beginning. And I presume this has been asked many times before, and I am sorry if so is the case, but what is the thought behind this discussion? An experiment of some sort? Congratulation for your article about Travel industry just amazing. Greetings from Big Bhutan Tours! We would like to take this opportunity to introduce our Travel Agent. We are Big Bhutan Tours, a private tour operator registered with Tourism Council of Bhutan. We provide various tour packages like Cultural tours, Eco Tours, Featured Tours, Adventured Tours & Treks and many others. We’re exploring opportunity to establish overseas partners and agents in China. It would be a great pleasure if Chines agents are interested to collaborate with our company. Thank you very much, and we look forward to hearing from you. i’am very interessted in partnership with a travel agency in china , could you please assist on this matter? 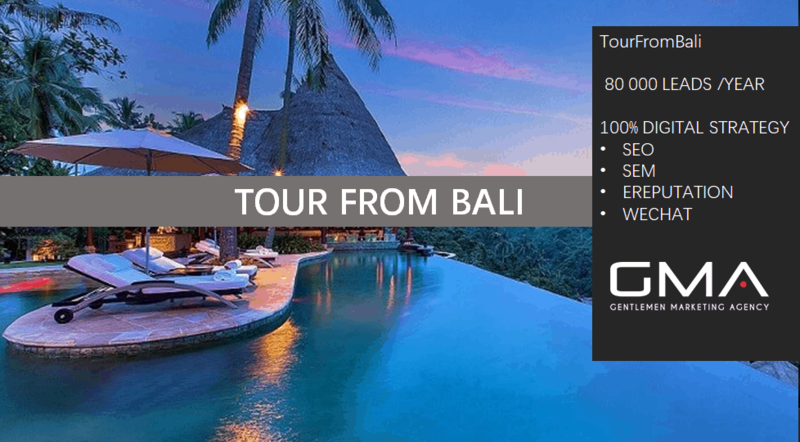 I am a Tour operator based in India, Can you help me to get Chinese tourists based on commissions? We do not work on commission. Should you wish to change your mode of payment and have a serious project, feel free to contact us. We will be happy to assist you. I am yobten,CEO of 4Approaches Tour & Adventure in Bhutan. i am so fortune to go through your article. My company has been looking for cluents from china but could not till now. With your information, i guess we could make some deal from china. hi Yobten, We are digital advertiser in China, Beijing, we are helping south east asian countries to do digital marketing in China. we can help to promote your company in China. We are a Hotelier based at Jaipur (Raj.) in INDIA and looking forward to attract Chinese tourists. Can you help us to promote our Hotels in China through digital marketing strategy. Hello Oliver, my name is Ivana and am the owner of a DMC in Croatia. According to what I have read recently, Croatia is becoming even more popular among Chinese tourists. But is also hard to get into that market. What we are providing are not the lowest price, but the experience of our country like we locals do. If you think it might be interesting for you, please let me know. We are open for various business combinations. Nice to meet you. Yes we can help you but we work with monthly fees the first year. My name is Chamith , Managing Director of Nelum Holidays & Tours, an active tour and travel agency in Sri Lanka. At the moment and according to high potential of the uprising market for Chinese Travelers (pleasure and business) to Sri Lanka, we wish to set up cooperation with proper Chinese companies in the field to grasp a share in this market. Respectively, we are looking for a reliable CHINESE partner to market and sell Sri Lanka tour Packages in China and we are willing to negotiate fruitful conditions with our international partners and achieve win-win situations. We can help you with a Marketing Campaign that will help you to find partner agencies. is there any way that we can build up partnerships with Chinese local travel agents? You have always a way. In fact we’re Tour operators providing traveling services to the land of Serengeti and Mount Kilimanjaro which is Tanzania destination, our packages mainly includes Wildlife safari, Mount Kilimanjaro climbing, Cultural safari and Group safari. We are excited to create partnership with reliable Chinese Tour operators towards our destination and we are capable in providing professional Chinese speaking Tour guide within our reach. And you want attract Chinese tourists ? Definitely, we are looking ahead on expanding our business scope to Asia, we’ll be happy to affiliate with other agents and marketing professionals. A very helpful article, We, MOODHU HOLIDAYS is looking to affiliate and establish partnership with reliable Chinese Tour operators for the MALDIVES market. We do not work as affiliate , but as marketing partner. If you are intersted you can contact us. You are very specialized about Chinese travellers Marketing, we can see that. It is difficult or not today to attract Rich Chinese in Europe ? Hello, we have recently established a small independent tour company based in Provence. We offer guided tours to all the major tourist attractions, most notably the Lavender fields and the stunning landscapes of Alpes de Haute Provence. We are passionate about this region and are aim is to give people an unforgettable holiday experience. We would appreciate any advice on how to attract Chinese tourists/ working in partnership with Chinese tour operators etc. Thank you very much in advance for your help. We Reply to you by Email Marie Therese. JUst read this article, and we will get the idea of to attract Chinese travellers . I am a tour operator in Uganda (Gorilla and Adventure safaris) and we do Gorilla trekking and wildlife safaris in Uganda and Rwanda. I had always wanted to get such information and I am happy that i found this very good resource. Chinese do not know about Gorilla safaris and it is a very fertile tourist ground right now. We would love to have Chinese tourists to visit Uganda and Rwanda to have the Wildlife experience. If we can have partnerships with local Chinese agencies, that would be great. Contact us and we will explain to you how you should attack the Chinese Market. And it is not with Spamming the Chinese travel Agency. Am Samantha from Tazania i am in China and i have become so interested in Chinese culture and am passionate about Tourism especially in my country thus i want to start a tourism agency that will assist and attract more people from China and am ready to settle for a plan .I am looking forward to working with you. Greetings from VIACAUCASUS travel company. Azerbaijan (Caucasus) is new destination for Chinese travellers. Azerbaijan is Gate of East and West. You can begin your travel to Europe from Azerbaijan. I would like to have idea of your package Price , fo my business plan. I hear many Chinese tourists will come to morroco , and how to attract Them (I guess it is your job Marketing to China) right ? Morroco +389% of Chinese tourists every year. Great Idea Contact us by email , our consultant will reply to you Khabil. I am operating a diving safari in Maldives. I am interested to promote it in China market. Hope you can help. I’ve been recommended the below travel company to help with flight booking and visa. I would like to know if they are a valid company and not a scam ? Could you confirm that they are a valild travel company. We can help you, but Contact us by email. And You seems to be based in China, so you can ask one of your colleague no ? You never speak about chinese tourists defecate or chinese tourists meme, I think it is important. Why chinese tourists banned in some country ? I see nowaday sweden … is a bad buzz for the country. how can they recover ? Why you need to focus on FIT independant Rich Chinese Travellers independant. I see that chinese tourists on reddit, is a big topic. Why chinese tourists behaving badly, and tell me Why rude chinese tourists stories are everywhere and not other country tourists ? Most Tour operator and tourism players highligh rthe rude chinese tourists in europe, and not the good one ? Very informative article. 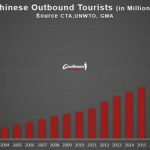 Do you have more information about Chinese tourists in 2018 ? any report ? How to Make yourself attractive to the Chinese Travellers before departure ? Good question. Forums, emag, SEO on Baidu are the 3 main tools. Greetings from Maldives booking services. We are a travel agency from Maldives. I would like to know if I can find out if the travel agency is registered or not in China. Or how can we get the registered travel agencies in China. We are waiting for your response. You want to resgiter yourself on Ctrip, that s another story. The country will discern this if your requirement is of a single Trip or even more than two to work. We know that Chinese tour operator was proficient at handling dynamic Trip and drama many time happen during transport. What do you advise for Private Transportation company to reach Chinese CLients? hi Garry, do not really understand your first part of your comment. For the question, recommend Chinese Website and Baidu SEO on a specific question related to transportation. I really pleased to find this website site on bing, just what I was looking for : D besides saved to favorites. This is a topic which is helpful for so mant SME in Travel industry… Take care! Thank you for these information a golden mine for tourism company. Currently, we are in the process of building our website so unfortunately nothing to show at this stage, though I can keep you updated on the progress. Essentially, the business will be a group of tandem skydiving operations at various locations across Thailand. Currently, skydiving in Thailand is a small industry though approximately 90% of the customer base are Chinese independent travellers aged 18-35 who are making bookings at high street tour agencies in Thailand. Do you have access to influencers that we could approach, such as high profile sports people or celebrities? We would like to take this opportunity to introduce our Travel Agent. We are Begaa Tours from Morocco a private tour operator. We provide various tour packages like Cultural tours, Desert Tours, Camel Tours, Featured Tours, Adventured Tours & Treks and many others.